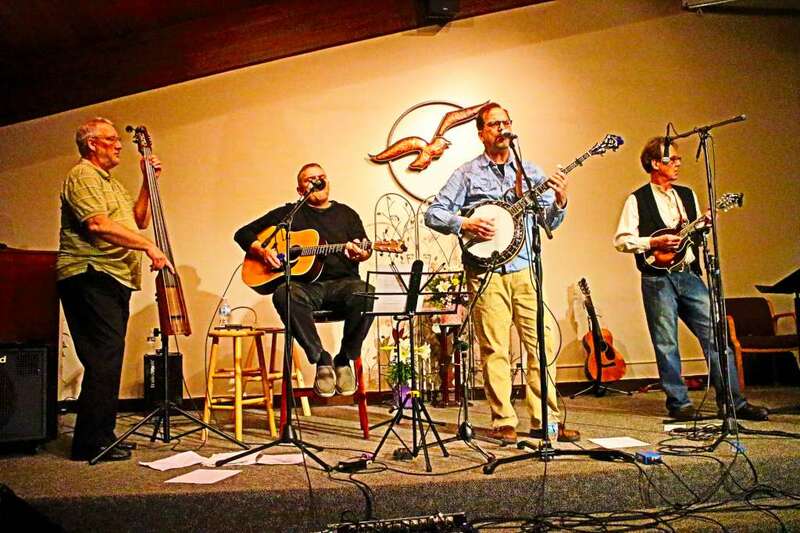 I've been trying to do a show review for Southeast Michigan's bluegrass "supergroup" Thunderwüde for over a year. I've seen them a few times, but somehow never remember to bring my camera. This weekend however, I simply could not pass up the opportunity to see them play in the very best venue around, Johnny's Speakeasy. For those of you not familiar with this extraordinary and magical place, just watch this. I have to admit, I'm a bit hesitant to write about the Speakeasy, in the same way a fisherman doesn't like to mention his favorite fishing spot--too much exposure can ruin the ephemeral nature of these special places. While some blue collar bricklayer, his name lost in history, may have built this room and it's vaulted ceiling, and generations of owners have continued to improve and decorate the space, I am convinced that the tiniest bit of every soul that makes the journey down the steep stairs to Johnny Williams' basement is drawn into the walls magnifying and supporting the magical JuJu that makes this simply the best place to hear live local music in Southeast Michigan, and quiet probably the whole world. 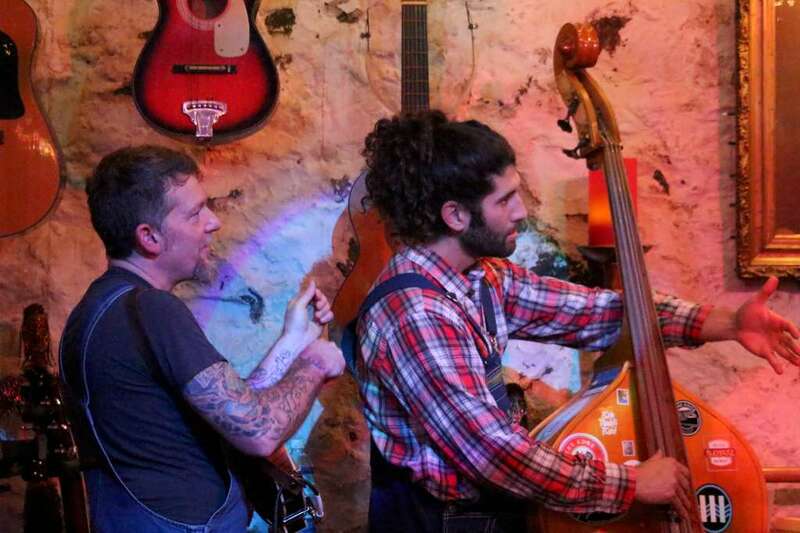 What began as an informal Wednesday night bluegrass jam at the Chelsea Alehouse Brewery has grown into a truly unique bluegrass band, Thunderwüde. Although they boast some high-profile fans, it is the bands musical chops that really set them aside. Every member of the band is a professional musician playing in multiple bands and side projects and a true master of their instrument(s). It is a true testament to the talent of this band that they manage to capture all the drive required of barn-burner bluegrass fiddle tunes without a banjo! 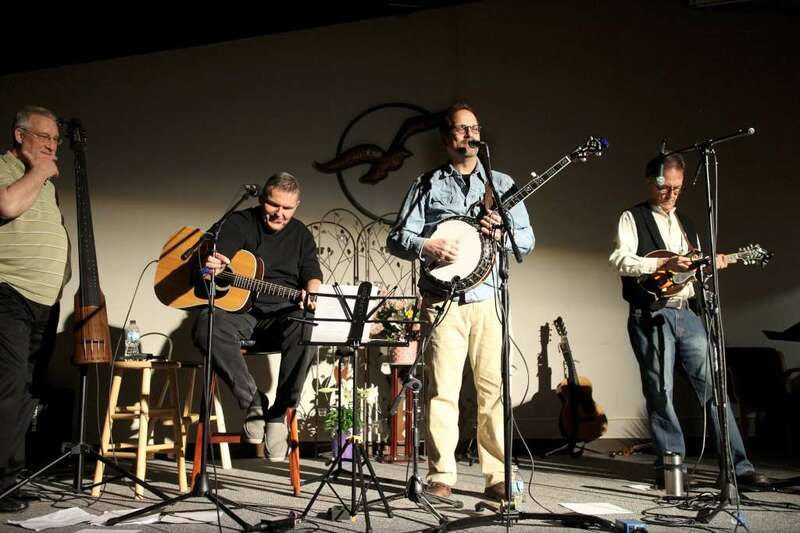 The band plays a great mix of mostly traditional bluegrass standards, with just enough variety drawn from some well known country, folk, swing and jazz standards. Where they really shine is on their original material. I'm a big fan of "High Standards" as played here at The Ark a couple years ago. The band takes turn singing the lead vocals and have mastered the art of three-part harmony so well that most of the time it sounds like a single voice coming off the stage and it's impossible to determine who's singing which part. Dennie and Fritzemeier kick off the show. Mandolin master Jason Dennie really shines in the band. With an effortless right hand he alternates between a driving chop and stinging fill riffs with near reckless abandon. On guitar he is equally versed at traditional flatpicking and fingerstyle leads. Dennie's talent lies not in playing fast (though he can keep up with the best of them), but rather with his mastery of the melody line. Whether of mandolin or guitar, his solo breaks really push the boundaries of traditional bluegrass walks, runs and scales venturing into lots of double- and triple-stop passages and jazz-chord infused countermelodies and syncopated counterrhythms. I find his playing ultimately refreshing and interesting. 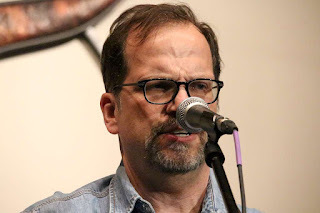 He is very personable on stage with a quick smile and "bluegrass voice" counter-persona on stage covering most of the emcee duties. He is obviously good friends with everyone in the band (and half the people in the audience as well) sharing jokes and running gags throughout the performance. The standout of the night had to be Wes Fritzemeier. 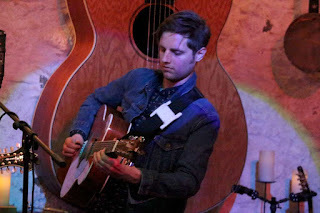 Beginning the night on the mandolin, he is every bit as good as Dennie on the instrument, with a subtly different, somewhat bluesier approach to his leads and an easy-going lope to his chop--a perfect foil for Dennie's fingerstyle groove. He instantly wins over the crowd with his warm smile and lighthearted comments from stage. His vocals are rich and nuanced with just a bit of dirt and grit thrown in for that authentic "mountain" sound. A few songs into the show he switched to the fiddle. Though he's been playing for over 20 years, he admits to having been playing more mandolin than fiddle lately. You would never know it, as his performance this night was one of the greatest fiddle exhibitions I have witnessed. 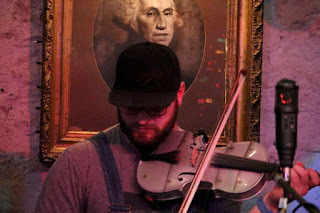 He pulls an amazing amount of tone out of his instrument, while displaying great mastery of acoustic dynamic--his fiddle lines wash over you like the pounding surf on the Great Lakes in summer; smooth and deceptively powerful at the same time. 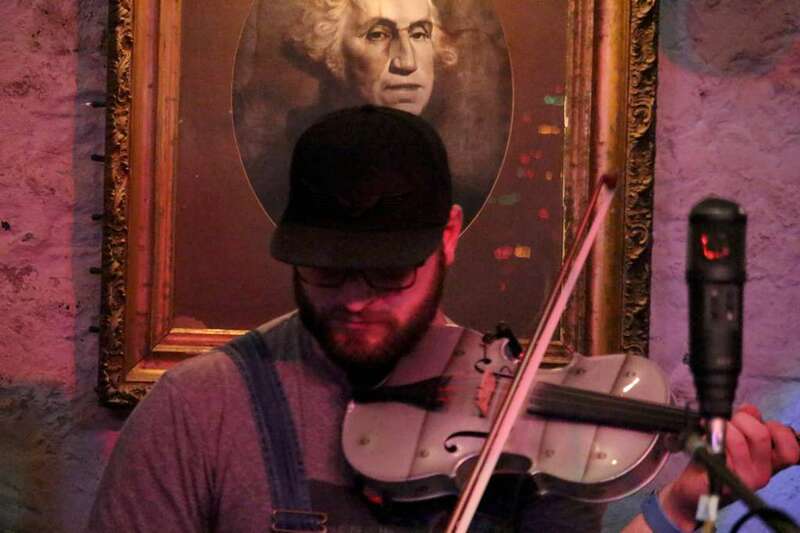 With finger-blurring prowess, he somehow adds fiddle fills in between his own melodies. His playing is so complex and technically perfect that I sometimes swore it had to be two fiddles on stage playing counterpoint to each other. This guy is a BEAST! Bassman Tommy Reifel forms the backbone of the Thunderwüde sound. I first ran into him as a member of the Ben Daniels Band when they played the Marquette Area Blues Fest several years ago and was blown away by his work on the upright bass. Proficient at the "I-V" bluegrass rhythm line, he sits right on the front edge of the beat, driving the band forward and creating a pocket that's impossible to fall out of. 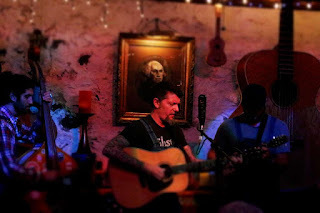 In fact, at the Speakeasy my friend comment that he'd never heard a band stay on beat for the entire show--never falling out of time once, and a bass player who hit every note on time! Reifel also has a talent for adding a few unexpected runs and solo lines to his playing which keeps it exciting and engaging throughout the show. He even thew in a cool bass solo break on a fiddle tune--something that you just don't see. While Dennie, Fritzemeier and Reifel have been playing as a trio lately, the show marked the return of long-time guitarist George Merkel. 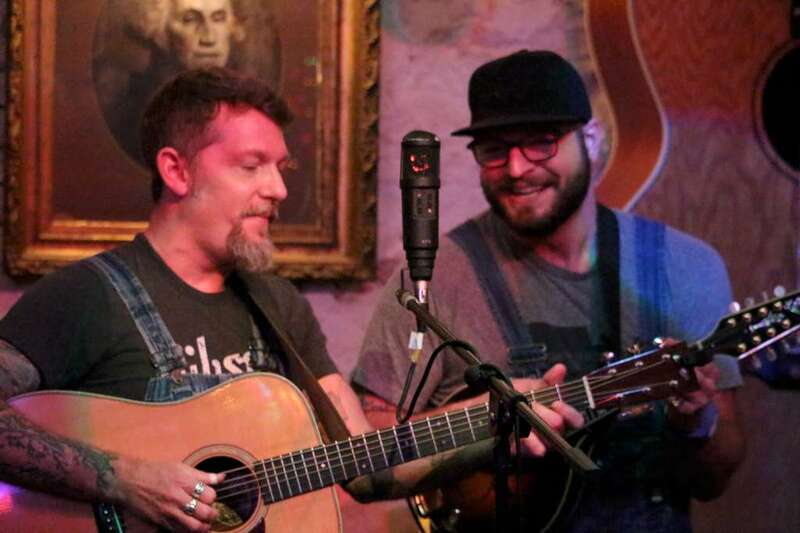 With him on guitar, Dennie on mandolin and Wes' fiddle, Thunderwüde really takes off; each of them switching easy from pounding rhythm lines to mind-numbing solo breaks with reckless abandon. Merkel's shy smile disguises his unbelievable flatpicking talent. He has one of the steadiest and effortless right hands I've seen and a flexible and FAST left hand which combine to give his breaks and easy flow and smooth delivery. He has a great voice for country-tinged bluegrass ballads--silky smooth, soul-filled and very easy to listen to. It's obvious I'm going to have to see Thunderwüde again (and again, and again...) and I really need to get out to the Alehouse on a Wednesday night. I've included some random photos from the show below. Feel free to use and distribute freely with credit to Semibluegrass.com. Want to see more like this? Please subscribe to the blog, or better yet, follow our facebook page (www.facebook.com/SeMiBluegrass). Visit the page and tag/share the photos there too. 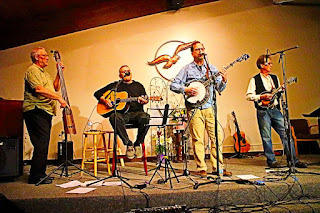 The Waynewood Boys Perform "Sawmill Sally"
Six years ago I got bit by the bluegrass bug. In search of people to pick with I ran a Craigslist ad looking for people who wanted to learn bluegrass and invited them over to my house (the first of what was to become my month SeMiBluegrass jams). My friend Bill was just learning the Dobro. Andy, an experienced electric blues guitarist showed up to learn bluegrass rhythm. Rachel showed up with her ska piano background and a new upright bass. And a soft-spoken banjo player named Hugh rounded out our first jam. I've since listened to those tapes. They're pretty brutal. However, we have all gone on to find out place in the SeMiBluegrass music scene. 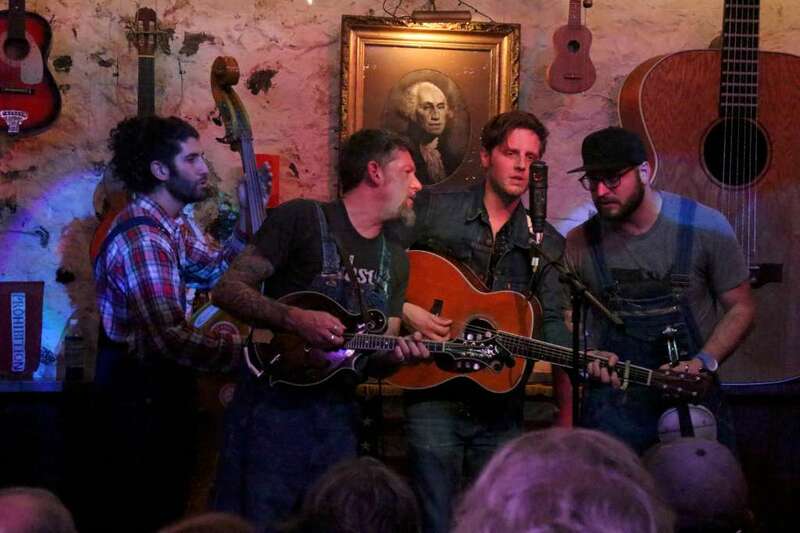 Hugh found his bluegrass muse writing and playing old-time flavored, traditional bluegrass with a local group of musicians. In a world where pickers band together in pop-up bands that last a couple shows, the Waynewood Boys have managed to not only survive, but have thrived, searching out and playing small, esoteric venues--the kinds of places where creative, artistic and meaningful music is still performed, praised and valued; the places where the audience sings along in perfect harmony; the place where the pulse of live music still beats strongly. 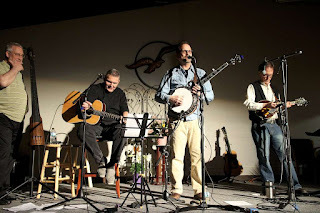 The Waynewood boys' latest--and most ambitious--work, co-written by Fader (banjo), Tom Megli (guitar) and Keith Buchannan (bass) is a Bluegrass Opera, "Sawmill Sally". Consisting of eleven original tunes that, taken together, tell a complex, funny and sometimes tragic story of love. loss and the consequences of rash action in late 19th century Virginia, this "concept album" may have exactly what roots music is missing today--a sense of meaning and purpose. The band chose to premier their work at the "Live From the Living Room" event at Unity Church of Lake Orion. This long-running concert series, hosted by local folk-music icon Maggie Ferguson and storyteller extraordinaire "Gypsy" Jack Ferguson is as close to a live taping of "A Prairie Home Companion" you will find. The night started with a bit of a variety show with some fun covers and poignant original music (and some fine story telling) from Maggie, Jack and friends. Following was a short set of original music from Sigrid Christensen off her newly released album "Little Vixen". Her soft, high voice paired perfectly with the poetry of her works, her subtle guitar work and some killer accompaniment on guitar, harmonica and trumpet. The Waynewood Boys took the stage for the main event. Clocking in at just over an hour, the songs were interspersed with short pieces of background and insight into the story. A high quality program was included with story notes, and selected short passages from the lyrics to help guide the listener. The band obviously enjoys what they do, launching into each song effortlessly and executing them flawlessly. Eschewing the barn-burner, faster-is-better mentality of many modern bands, the Waynewood boys opt for a more thoughtful and methodical to many of their songs. The first few numbers definitely have an old-fashioned sound to them and perfectly transport the listener back to late 1900s Virginia and set the mood for the story. 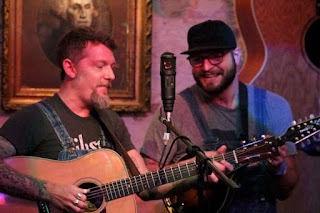 As the performance continues, the band mixes in some other influences including more progressive bluegrass sounds, some acoustic blues and folk, and even a bit of a modern rock vibe. The band is polished, and easily sinks into the groove laid down on bass by Buchannan. Megli's Carter-family influenced flatpicking gives the songs a lot of depth and drive, while Fader's banjo contributes both melodically and rhythmically. Multi-instrumentalist Mike Francis fills out the songs with some tasty mandolin chops and some of the richest, most toneful fiddle work around. Sawmill Sally is both well-conceived and well-performed. The story begins with Broken Window Blues where we meet Sally and learn "don't be deceived by what you see...or what you don't see". We meet Henry Johnson, love-scarred and driven to success in Virginia, and then follow the ups and downs of his courtship and marriage to Sally in Sally Barlow, For the Rest of Our Lives, and Starving at a Feast. In the "disarming" song One Arm Jake we meet Jacob, the young, love-struck anti-hero of the story and the tragedy that effects all of them. These consequences are explored in The Trial of Henry Johnson, Watch Over You and Prison in my Mind. The story comes to it's tragic ending in Dead on the Ground. 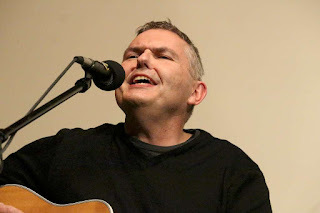 Wrapping up the tale is How Can I Go On, which ends on a sorrow filled lament with just a ray of hope--only to launch into an upbeat chorus from Broken Window Blues bringing the story full circle and the night to an end. This is a very enjoyable, and refreshing way to experience the finest in bluegras and good, old-fashioned story telling. I hope the Waynewood boys (and many others) continue bringing this kind of thoughtful, intelligent songwriting to life and sharing it with the vibrant live music scene in SouthEast Michigan. I will definitely keep going to see stuff like this. And you should too. Additional photos from the evening are shared in the Gallery below. Please feel free to visit the public Facebook gallery and tag the people in the pictures. You may also freely use and share these images with credit give the SemiBluegrass.com. Like what you see here? You can subscribe to this blog, or follow us on Facebook for more live, local music in SouthEast Michigan.